SuperFogeys - SUPERFOGEYS 5TH ANNIVERSARY WRAP-UP AND WINNER ANNOUNCEMENT! Well, today is the end of the big 5th Anniversary Celebration. I want to thank everyone who participated by lending their talents and showing their fandom with a chapter recap, a piece of fan art, or a short essay. I was blown away by the love and detail you all put into your efforts. With the exception of Chapter 11 (unfortunately, the person who signed up for Chapter 11 was not able to complete the assignment), the recaps were just a pure pleasure to see. I really had no idea what you were all were going to do with them and what you came up with was inventive, surprising and, most of all, fun. If you’d like to check out the all the recaps, you can start with the first one right here! 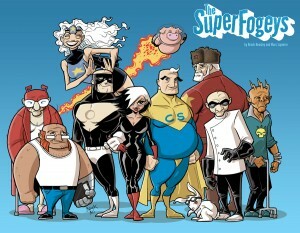 • The original ink art to the SuperFogeys 5th Anniversary Print I drew up! • An original “Lunchtime Sketch” drawn by Marc Lapierre and commissioned by you! • A walk-on role in an upcoming SuperFogeys strip! And the winner is… Will Boyer! Congrats, Will! Please email me your address, a photo of yourself and your request for the Lunchtime Sketch and we’ll get your prizes out to you pronto! Thanks again to Will and to everyone who participated! See you next week with fresh SuperFogeys and SuperFogeys Origins! Congrats to Will! That’s an incredible prize package. Brock, is the SF 5th anniversary art above going to be available to the rest of us for purchase? Whaaaaaaaat?!? There’s, like, a second Will Boyer who entered this contest, right? Well, anyway, um, that’s awesome. I wish I had been able to do more than what I did for the anniversary celebration. Wow, thanks. Congratulations, Will! This was a fun event, Brock and Marc. Thanks for letting us all be a part of it!